Today, October 17, an explosion at the Kerch Polytechnic College killed 10 people, the Center for Disaster Medicine reported. Director of the Crimean Republican Disaster Medicine Center Sergey Astankin said in a commentary to Kryminform, that about 50 people were injured. Preliminary information suggested a gas explosion at the educational institution. EMERCOM specialists are clarifying circumstances of the incident. Victims are hospitalized in a local hospital, users of social networks report. Meanwhile, the Russian media reported, with reference to the National Anti-Terrorism Committee of the Russian Federation, that the explosion was caused by the detonation of an unidentified explosive device. The first version of the terrorist attack was suggested by users of social networks. Public Mash, citing eyewitnesses, reported allegedly shooting in the college building before the explosion. “Before the explosion shooting was herd on the ground floor of the first building, the eyewitnesses say. No confirmations yet. 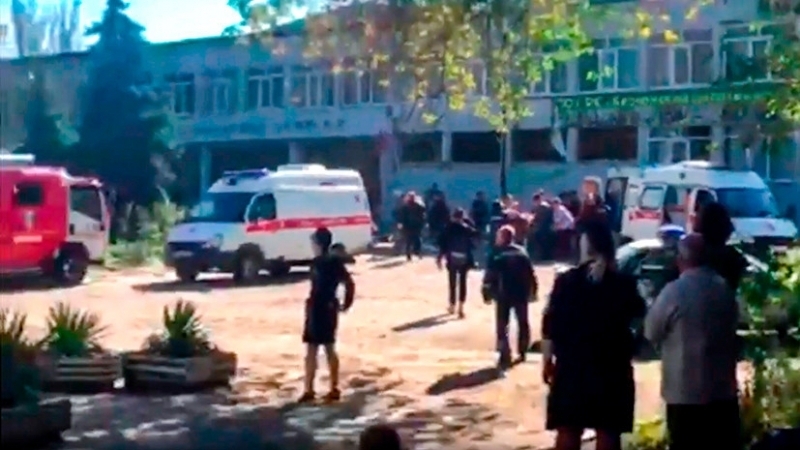 Olga Grebennikova, director of the Kerch Polytechnic College, told the Kerch.net publication that unknown people with weapons had rushed into the building of the Kerch College and started shooting at the students inside. According to her, unknown persons opened the doors to the classrooms on the second floor and "killed everyone who came across." Five ambulance brigades from Kerch and several medical teams from the nearest settlements are working on the scene.